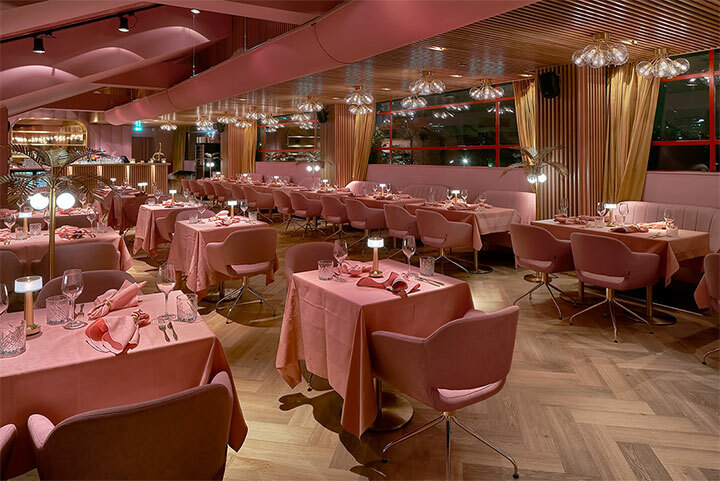 Designing a restaurant interior around one color does not necessarily take much courage. When the color is pink, however, the decision may be risky. 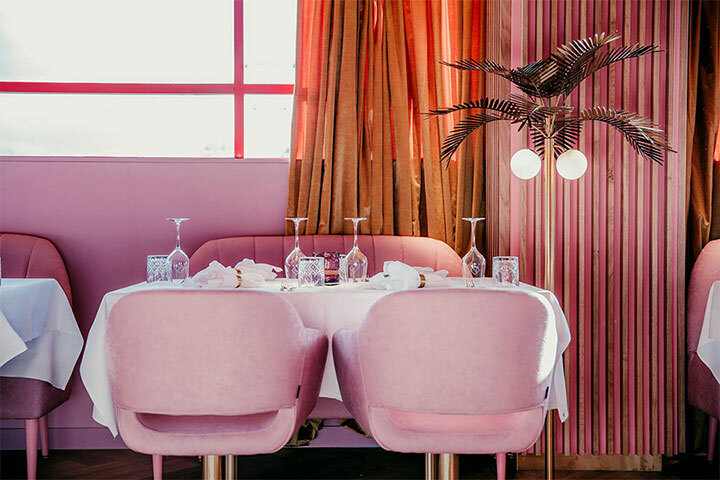 An interior designed in hues that are typically associated with babies, bubble gum and cotton candy may be too much for a considerable segment of your potential clientele and might be seen as too feminine. 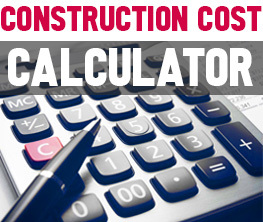 But even such a task can be successfully accomplished by good design and smart choices. 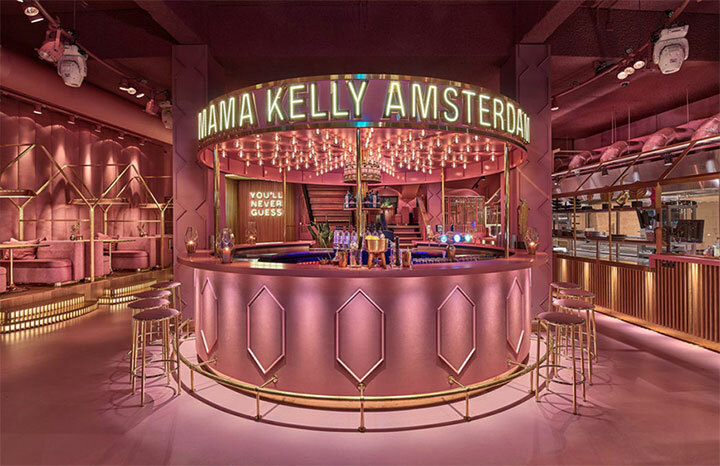 Rein Rambaldo and his wife Willemien, together with restaurateurs Singha Witteman and Bas Bloemink opened the MaMa Kelly restaurant at the Olympisch Stadium on the outskirts of Amsterdam and aced the mostly pink restaurant design project they had in mind. 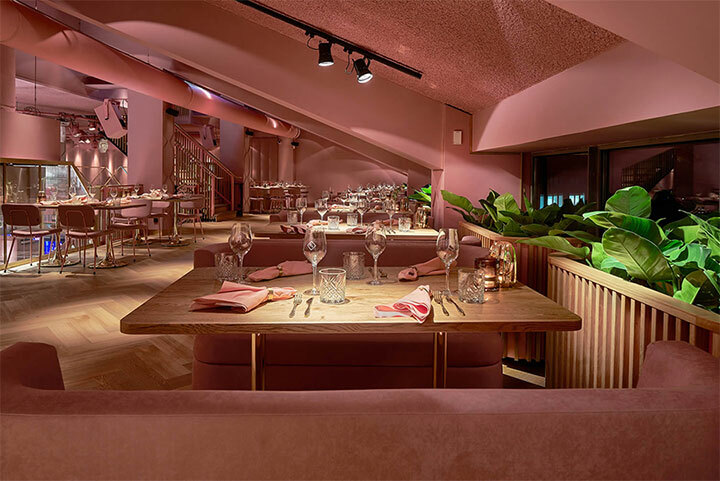 Bathed in soft pink hues that extend over the walls, ceiling, carpet, furniture, accent pieces and the occasional tone-on-tone decorative touches, the restaurant appears fresh and perfectly approachable. As a perfect complement for the pink color, gold accents enhance the idea of luxury and the sense of entering another world. Wood is also used in conjunction with brass accents as a balancing act for the monochrome design and adds just a pinch of visual contrast to the mix. Its honey color preserves the sweet, soft overall effect of the interior and, combined with strategically positioned lights, creates a dreamy atmosphere. 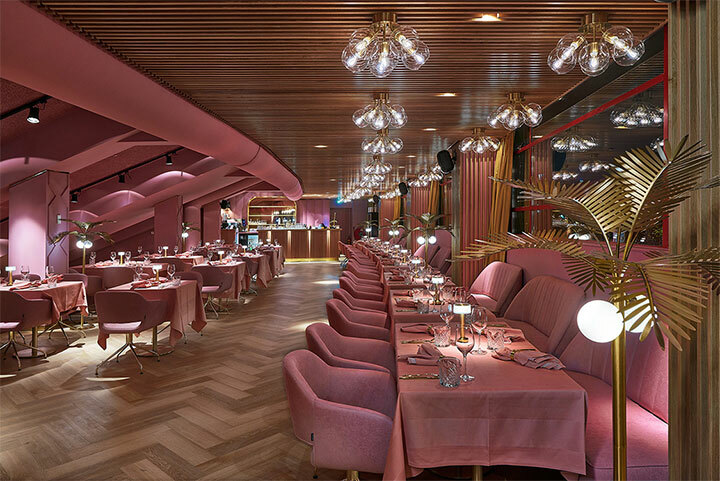 Despite the pink, the few shell-shaped couches, the soft pillows and the bouquets of clustered lights, the restaurant design does not come across as overly feminine. 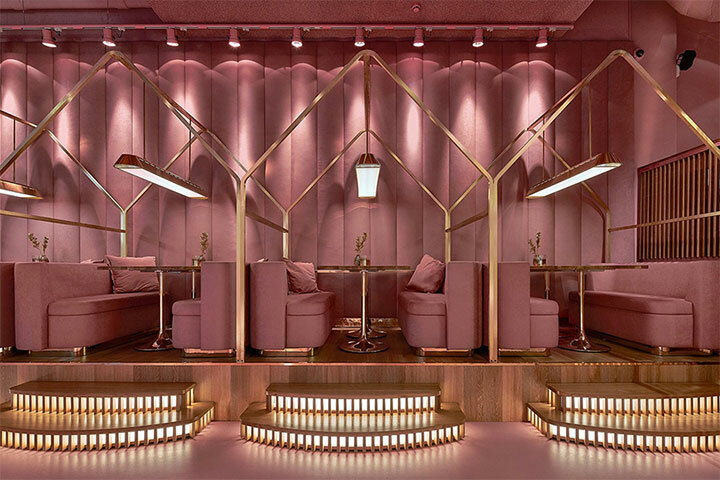 The pink is toned down by the angular structural lines of the ceiling and the simple, modern lines of the furniture. While the furniture pieces are not necessarily masculine, they stay away for other potentially feminine-looking ornamental details. It is interesting that the restrictive color palette corresponds to the limited menu, centered around lobster and chicken. The success of MaMa Kelly shows that, after all, knowing exactly what you want and going for it is a winning card – even when what you want is serving seafood and poultry in a sea of pink. 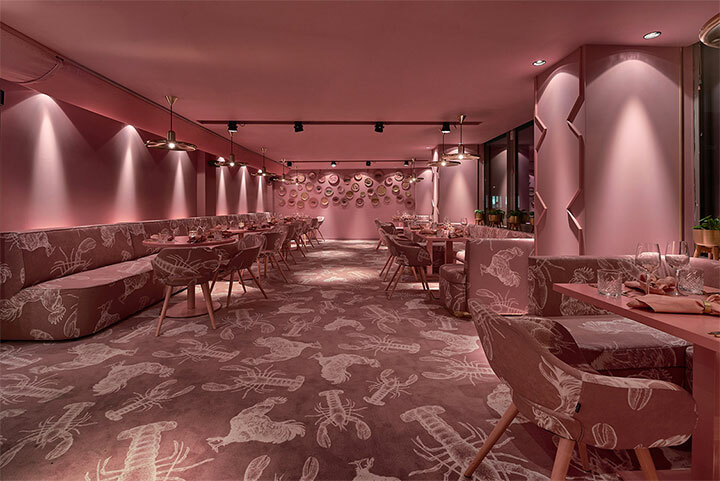 Finally, because the color palette is so restricted throughout the restaurant, the designers were able to use bold patterns without overwhelming the design. Large images of crustaceans and chicken fill the carpet and upholstery in one area of the restaurant. Here, the decorative accents are kept to a minimum and allow the oversized design to do the talking.